Fishing Bali is located in Padangbai - East-Bali. 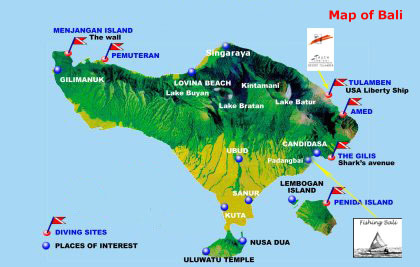 This small fisher village has also a harbour where the ferry's to Lombok and Nusa Penida operate regularly every 2 hours and accommodations are availabel in different standards. Some beautiful sightseeing are also very close, like: Tirtagangga Waterpalace, the Ujung Kings Pools, the Bali-Aga Village Tenganan, the holy Bat Caves at Goa Lawah and the tourist village Candi Dasa - all worth to get visited. Copyright © since2007 www.bali-fishing.com. All rights reserved.